Rudolph the red nosed reindeer...Sing it with us!...Had a very shiny HORN. Wait, what?...And if you ever saw him...Ah, that’s better…You would even say he’s a UNICORN. Now wait just a gosh darn minute! Disrupt the norms this holiday season with this super-fun take on a classic Christmas party trend. 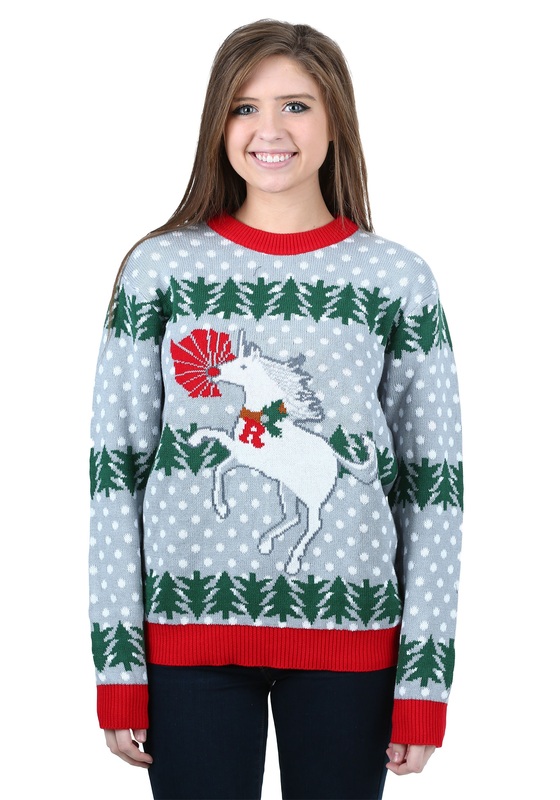 Leave the pom poms, sequins, and Grandma June’s needlework locked in a trunk; this Unicorn Rudolph Ugly Christmas Sweater can get you ready for your eggnog in humorous and huggable style! It features a festive print of polka dots and pine trees, with an unmistakable Rudolph unicorn prancing front and center. Take a page out of ole’ Rudy’s book and show that you’re comfy being different. It’s about time your pals learned your new rendition of a classic!